The Judicial Review hearing will be heard with three other cases arising out of the police’s actions over the course of the Royal Wedding bank holiday weekend: two concerning raids on squats on 28 April by officers of the Metropolitan Police Service and the other arising out of another pre-emptive arrest of a minor on the day of the Royal Wedding. The 15 claimants, who were all released without charge once the public celebrations had finished, are being represented by Karon Monaghan QC and Ruth Brander. The claimants in the three other cases have different legal teams. Those arrested were not a cohesive group and they did not have cohesive aims. Some were people on their way to peaceful protests, others were people the police merely suspected of being protestors. 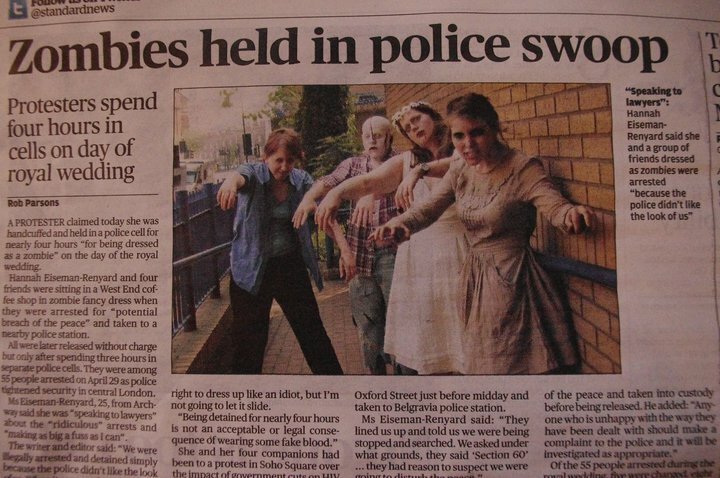 Those arrested include members of the ‘Charing Cross 10’ who were on their way to a republican street party, the ‘Starbucks Zombies’ who were arrested from an Oxford Street branch of Starbucks for wearing zombie fancy dress, and a man who was simply walking in London and was arrested by plainclothes officers because he was ‘a known activist’. Posted in Activism, Blog, Court case, Rabid EnthusiasmTagged bridesmaid, Court case, defend the right to protest, Green and Black Cross, jubilee, kate middleton, Netpol, no justice no peace, occupy, olympics, precrime, protest, queer resistance, republicans, royal wedding, see you in court, the network for police monitoring, unreasonable force, we are all Alfie Meadows, what the tap-dancing crap were the Met thinking?, william windsor, zombieBookmark the permalink.